I’m slowly writing a series of posts on our trip to North Carolina last week. I’ve written about our dinner last Monday at Lantern; our visits last Tuesday to the Duke Homestead and Nasher Museum of Art in Durham, our visits last Wednesday to the Greensboro Historical Museum, the International Civil Rights Center & Museum, and the Weatherspoon Art Museum in Greensboro; and dinner last Wednesday at Crook’s Corner in Chapel Hill. 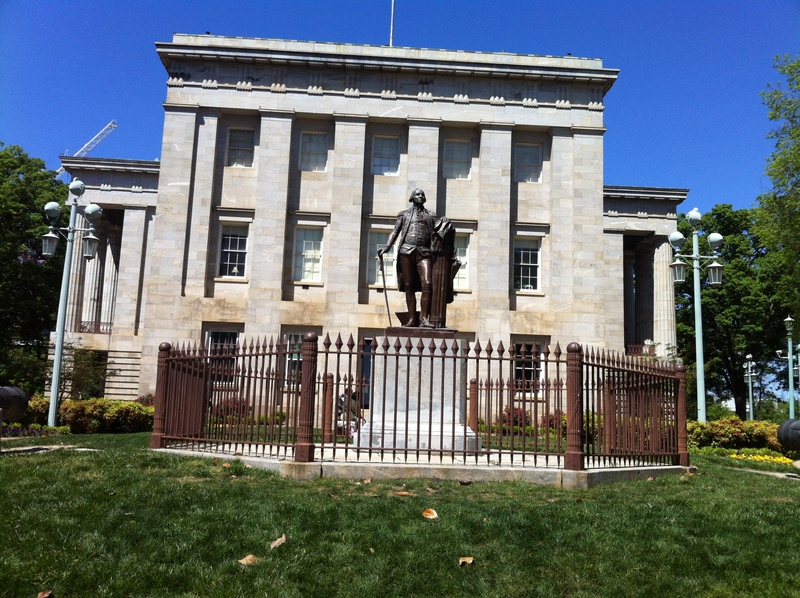 Next: more posts, on the places we visited during our Raleigh outing last Thursday. We arrived in Raleigh a little after 10:00 last Thursday morning, coming in from the west past the Carolina Hurricanes hockey arena, the North Carolina State Fairgrounds, and the NC State ag school. Pretty open spaces, no urban feel. The transition was sudden, and in moments we were passing by the north side of the main NC State campus, with lots of traffic, coming in on Hillsborough. 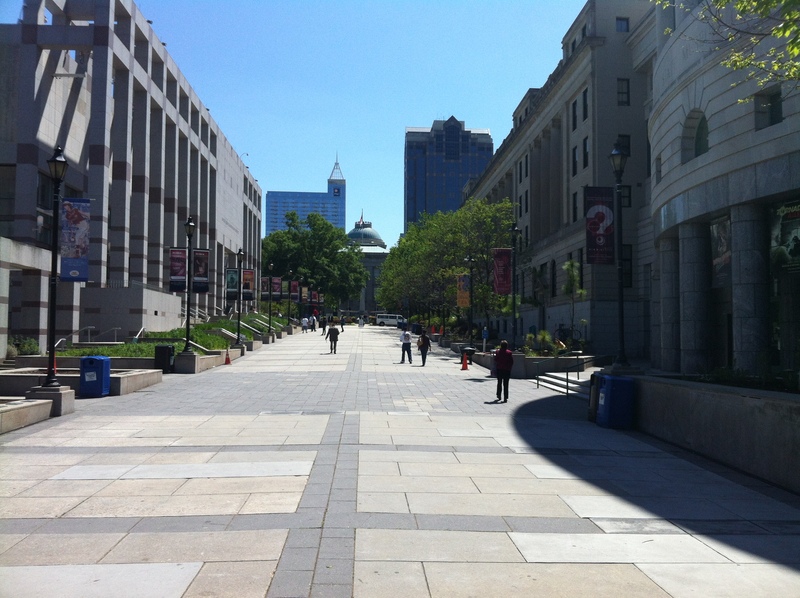 The State Capitol occupies a square block in the center of the city, with streets from north, south, east, and west deadending at the block. Hillsborough is the street coming in from the west. I imagined we would see the capitol from afar, but between its modest scale and the trees, it emerged only when we were two blocks away. The main entrance to the capitol is from the east. A couple of school groups were lining up to enter. We squeezed past them, went through the east door, and got in line at the security desk behind a family of three from England. When it was our turn, the security guard asked for ID from one of us. I gave her our license and wondered what systems her computer tied into. Could she log into the NSA files and review my email and bills? I suppose not, but I know she spent a good half minute doing something at her computer before okaying us. We went through the metal detector, beyond which was a counter and a woman offering information. She gave us a guide to the building and a brief orientation, telling us to come back if we had questions. I soon realized that tours were only available for classes, of which there were several working their way around the building. Looking at the website now, I see that tours for the general public are given only on Saturdays. Since Gail wanted to use a restroom and the women’s room was one floor up, that’s where we started our tour. While Gail was touring the restroom, I proceeded to the central atrium and looked in on the legislative rooms to north and south, the Senate and the House. They were beautiful. Gail joined me and we went back and forth between the two, walking in as far as was accessible. There are plaques on the wall listing the members during the 1840 and 1961 sessions. Had I read the pamphlet I was holding, I would have realized this, but the legislature moved out of the building after 1961. 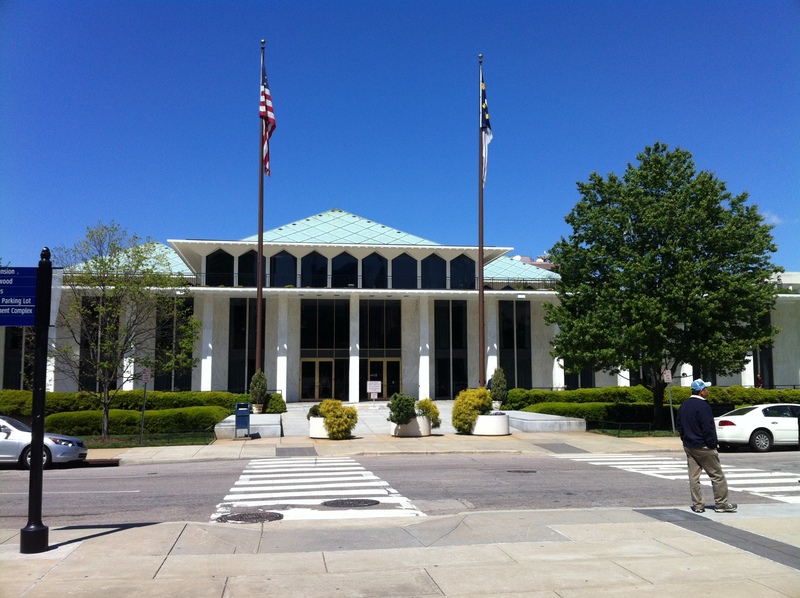 My other clue was the fact that there is a new Legislative Building two blocks north, which we had driven past in our search for a parking deck. There are public galleries on the third floor. We couldn’t enter them, but could look through the doorways and down on the two meeting rooms. Also on the third floor, to the west, was the meeting space for the state supreme court, and to the east, the state library. The court moved out of the building early on, with the space converted to storage for the state geological collection. A sign explained that the state hired a geologist to survey the state and look for economic opportunities. The collection has since been moved to UNC, but representatives remain in the room. 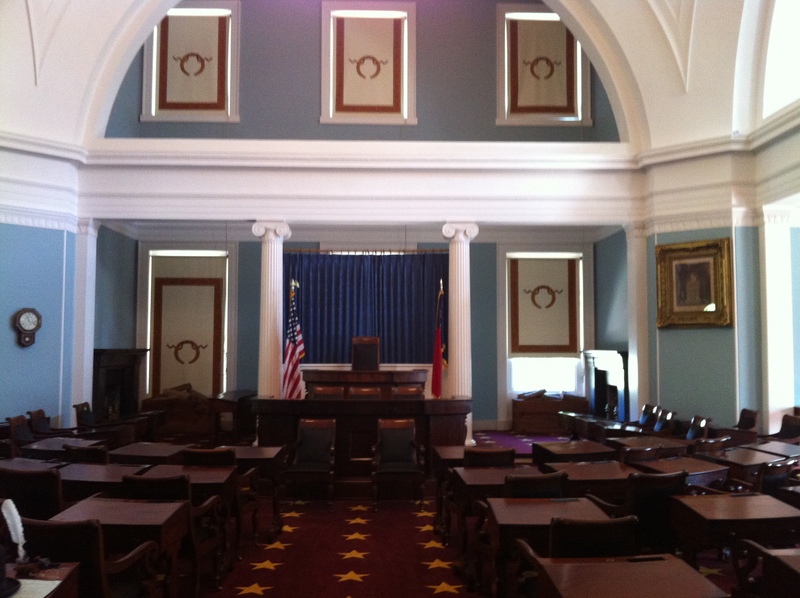 I’ve failed to explain that the earlier state capitol building had burned in a fire in 1831. The replacement was built between 1833 and 1840. The state library had gone up in flames with the building, except for the books a particular legislator had taken out that were a year overdue, or so the sign explained. 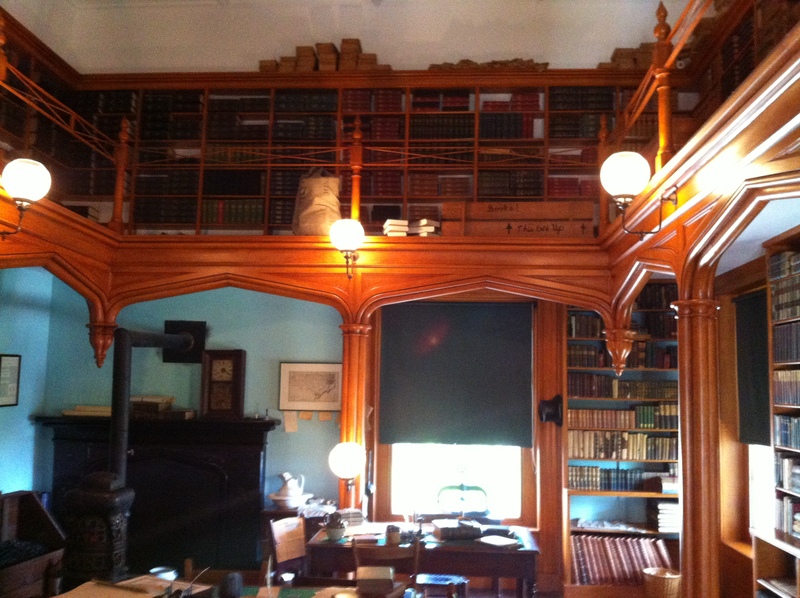 His books and a donation from former president Madison formed the nucleus of the new collection. The supreme court moved out, the legislature moved out, but the governor remains. Back on the first floor, we looked down a closed off hall to current-use offices. Across the way, a class of kids was looking into a room. We joined the line, then had the space to ourselves, staring into the array of furniture, not yet understanding that this was the real, live governor’s office. A sign explained that this and the not-visible room beyond were the offices of the governor and governor’s assistant, with the governor in the room beyond until, more recently (the 1940s? 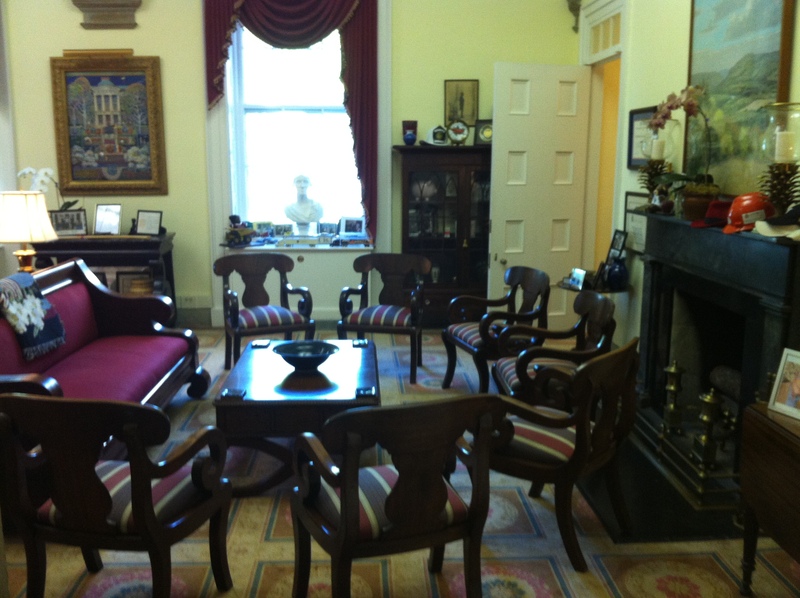 I don’t remember) the governor switched them at which point this room became the governor’s office. It has a pair of doors that swing open when the governor isn’t in, revealing the doorway we were standing at and looking through. To the left of what you see below is a large desk and additional furniture that it was difficult to make out. We completed our tour by chatting with the woman who had given us the still-unopened pamphlet at the start. She was extremely knowledgeable, and funny. She said something about giving tours on Saturdays, which I now realize makes sense, since those are the days of public tours. She also filled in some of the gaps in our understanding. We learned about the construction, all stone. None of that pine that burned down a few years earlier. 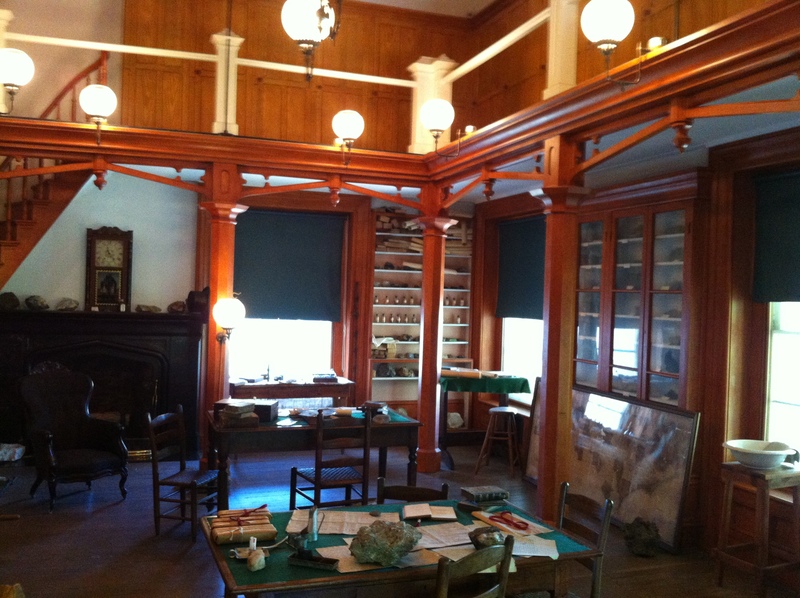 And we learned that the old House and Senate rooms are available for rent. I asked if we could hold parties there. No. No food or drink. Just meetings. Here are two of the many stories she told: In the early years, there was of course no indoor plumbing. To use bathrooms, those working in the building had to head outside to a privy in the far corner of the property. In particular, that meant those poor judges on the third floor had a long ways to go and a hard climb back. No wonder they moved out early! And those books that President Madison donated? Well, you know, Dolley was a NC native. After the fire, she was so sad. Every night — our guide imagined — Dolley would look at James in just the right way, with just the right voice, and ask if he wouldn’t want to give some of his collection to the state. You know, the way women do. Until he said yes, sure. I suggested that maybe the guide wasn’t supposed to let me in on the secret ways of women. Too late. and back south through the mall to the capitol, with the museums to the sides. From the capitol, we would spend a couple of hours in the history museum. Then we went into the legislative building, pictured in closeup below. After checking in, we walked up along staircase that leads directly to the third floor. To east and west are the public galleries for the House and Senate. They were locked, but we could look through the glass and down to the legislative spaces on the second floor. They lack the elegance of their 1840 counterparts, but were more attractive than I anticipated. 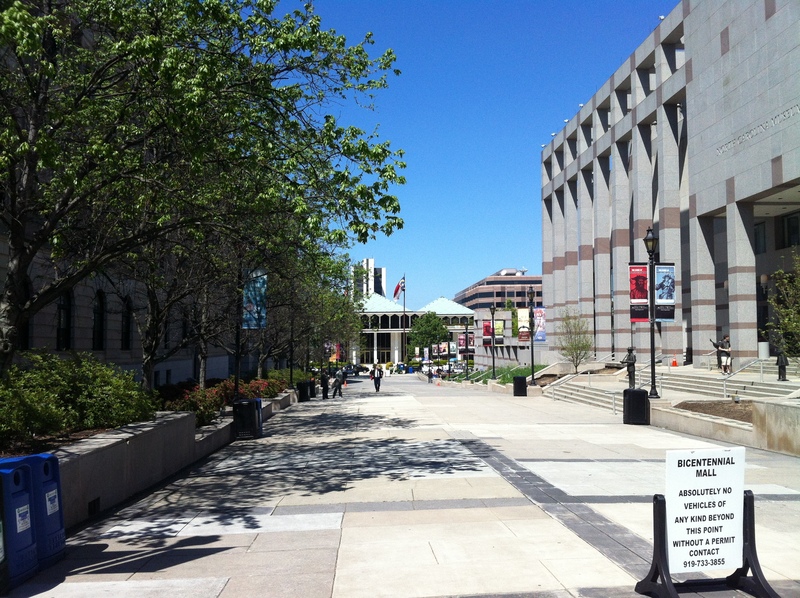 I skipped over our time in the North Carolina Museum of History. More in the next post.